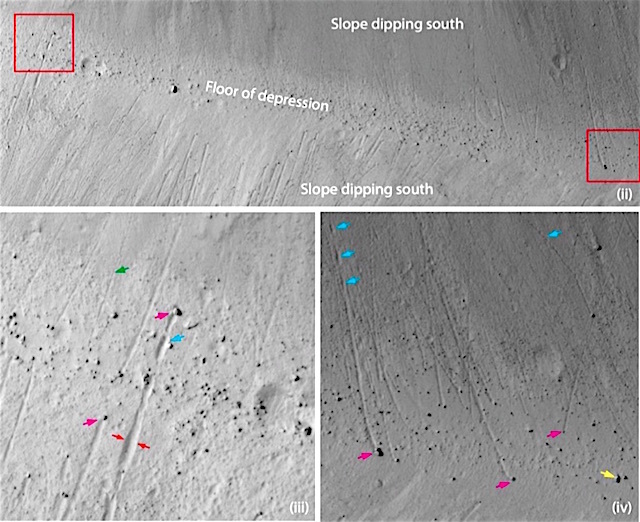 Boulder trail populations were measured along faults on Grjota Valles, Mars to test the hypotheses that these faults are locations for possible marsquakes. If the boulder trail populations are due to single marsquakes, one theory is that the boulders were moved in the very recent past by large magnitude marsquakes. The area we studied showed that there are coincident maxima in boulder trail density and boulder trail widths along the strike of the faults in Grjota Valles, Mars. We also saw that the boulder count values decrease away from the locations of most boulder trails. Our results show us that geographically coincident maxima in boulder trail density per km and boulder trail widths along the fault exist. This suggests that a plausible mechanism to mobilize such populations of boulders is through seismic shaking associated with palaeomarsquakes. Our results point to this possibility because boulders mobilized by seismic shaking display a particular pattern: the number of boulder falls and boulder sizes decrease away from the epicenter. This entry was posted in Reports and tagged boulders, Grjota Valles, InSight, Interior Exploration Using Seismic Investigations Geodesy and Heat Transport, marsquakes, seismicity. Bookmark the permalink.